SNAFU! : FNSS delivers it's PARS III to Oman. FNSS delivers it's PARS III to Oman. 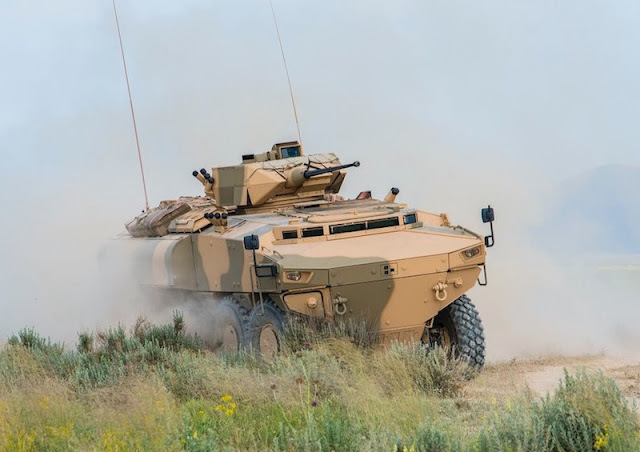 On its website, FNSS says that PARS III 8X8 is the new generation of wheeled armored combat vehicle (WACV) designed and developed with a special emphasis on mobility, protection, payload and growth potential. The vehicles employ the latest designs and technologies with a focus on the performance and durability of modern military operational requirements. The vehicles are available in 4X4, 6X6 and 8X8 configurations. The PARS family of vehicles takes its name from the “Anatolian Leopard”. The PARS III 8X8 has an all-up combat weight of 30 tonnes, and is powered by a water-cooled diesel engine, coupled with a fully automatic transmission which generates a maximum road speed of up to 100 km/h. Another 30 ton 8x8. The evolution we've seen in wheeled combat vehicles has been stunning. Not too long ago if you said an 8x8 wheeled IFV would weigh 30 tons, people would have called you crazy and claimed it would be good for only highways. Now its almost common. I dare say it is common! IEDs is to this generation of warfighters what the "Atomic Age" was to the old skool guys in the 50's. Everyone predicted that it was the future of warfare and then we ended up in a decades long counterinsurgency op in SE Asia. I wonder what the next battlefield will show is king. My guess is electronic warfare. Not air based but ground based systems that totally screw up the latest hotness...dispersed units.